The 2019 YOUtopia Co-Producer Role Description is now live. A link to the application is at the bottom of the doc. Check it out and apply by 1/6/19 if you’re interested. Please direct all questions, comments, suggestions, and complaints to BOD@SDCAP.org, preferably in haiku format. Streamlining the BOD’s YOUtopia processes for oversight obligations including budget, wrap-up, incident resolution, etc. Improving BOD communications & collaboration with the community, YOUtopia Production Team, and CoLab Team. We did manage to cover all of the above (woo! ), and came to consensus about a great deal of it. As it goes in consensus building models, we don’t all agree 100% on everything, but everyone’s voice gets heard and we work hard to make decisions each person finds acceptable. First up, here’s the scoop on why we looked at changing the YOUtopia Production Model, our methods, the decision, and implications for 2019 & 2020. YOUtopia Production Model – to Change or Not to Change? For some context, YOUtopia is one of the few Regional Burns that uses a 2-person, Co-Producer model; most Regionals using Planning Teams of approx. 6-9 people. Sometimes these teams are the BOD of the non-profit or LLC, sometimes they overlap, and sometimes they are discretely different. 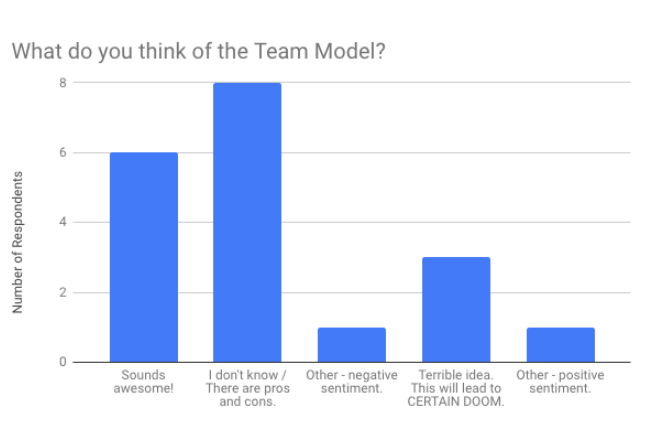 We don’t necessarily think a team is better or worse than a Co-Producer model, but it sure is different, and we thought it was worthwhile to explore. When looking at these issues in conjunction with our organizational structure, one interpretation is that much of what ails YOUtopia is a result of too many cooks in the kitchen and too much turnover among this giant group of cooks. The event is the equivalent of approximately a half-million dollar business, yet the management team currently includes 2 producers (Co-CEOs) 12 Hub Co-Leads (Executive Team), 50 Department Co-Leads (Management Team), all overseen by a 7-9 person Board of Directors. There are billion dollar organizations with much smaller management teams which – not surprisingly – run way more smoothly! We’ve been talking about this for a while – many months, if not well over a year. Some of the feedback we received (we promise, more on that to follow) was from folks concerned that we were considering this change as a reaction to specific problems in 2018 Production. Not so. It’s tough to carve out time and space for extensive research and methodical planning when YOUtopia Production takes up the entire calendar year (we’re still wrapping the current year while we beginning planning the following year) and when we also have CoLab, year-round grantmaking, and various other projects and endeavors. So big picture things like this come up for conversation along the way, we chat about them at retreats, and then eventually we get around to tackling them. We’ve been talking about how to improve YOUtopia Production for a while and we finally carved out the time and space to do a deeper dive. Was our motivation increased due to problems during the 2018 Production cycle? Probably. Would we have addressed this possible change regardless? Yes. Given the time necessary for realizing any responsible vision for change, we suspected 2019 would be a deep inquiry year, with any major changes arriving for 2020 after input from a transitional team. We’ve reviewed models other Regionals Use, including organizational charts and reports, and had conversations with folks inside and outside YOUtopia. We also drew on our own internal bench-strength, as our BOD members have experience/education/training in management, process improvement, and organizational development. Prior to the BOD retreat, we sent out a short survey to the 2018 Production Team as well as some past Producers/Leads. It went to approx 70 people via email and was posted to several Facebook groups. Did it comprehensively include everyone who’s ever been a Producer or worked on the Lead’s Team? Unfortunately, no. Do we still think it gives us a reasonable representation of people with YOUtopia Production experience? More or less. 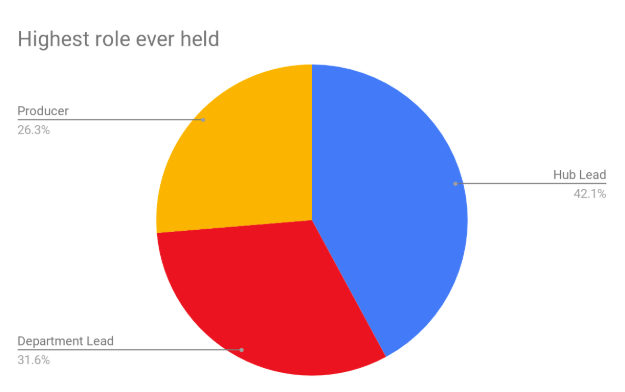 There were a total of 19 survey respondents, including current and past Producers, Hub Leads, and Department Leads, a good proportion of whom have been involved with the event since before it was YOUtopia and before the 501(c)(3) existed. This 27% response rate is better than we usually see with YOUtopia surveys. In addition to gathering some information about each respondent, we asked 3 questions about the Production Model. The first 2 were multiple choice and the 3rd was open-ended. For questions 1 & 2, there were 3 multiple-choice options as well as the ability to write in “Other.” For analysis purposes, “Other,” responses were recoded into Positive or Negative Sentiment, as they all fell in one camp or the other (i.e. none of the write-ins were neutral). 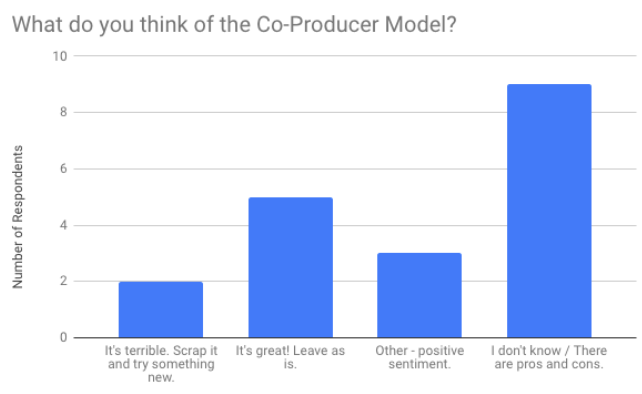 Question 1: What do you think of the Co-Producer model? Question 2: What do you think of replacing the Co-Producers with a small leadership team of 5-9 people? It would be *kinda* like the current Hub Leads system, but with each person having more direct accountability, responsibility, and autonomy. Question 3: What other suggestions do you have for improving YOUtopia Production? 32% of respondents were in favor of more autonomy, decision-making power, and accountability for Hub Leads. 26% of respondents said what’s problematic about YOUtopia Production is ineffective/problematic/toxic leadership, not the model itself. 10% of respondents attributed some problems in Production to the fact that under the current design, people are intended to stay in their roles for 2+ years for training/planning/succession purposes, but in practice it’s not working out that way. While we were hoping to gain a little more clarity from the Production Survey, we’re not terribly surprised we didn’t see a strong trend emerge. There’s a lot that works really well with YOUtopia Production, and with respect to things that aren’t working well, there are numerous viable ways to problem-solve. In the end, we decided it’s time for change. The BOD is committed to YOUtopia’s continuing evolution, and while our processes and systems become more complex and professional year after year, our management structure has not kept pace. We’ve leveled up our budget, insurance, contracts, safety protocol, and myriad other operational areas over the past 6+ years, and it’s time to do the same for our Production Model. This change will go into effect for YOUtopia 2020. YOUtopia 2019 will be a transition year. We’ll still use the 2-person Co-Producer model for 2019, with an eye on preparing for bigger change in 2020. We expect 2019 Production will look much like it always has, with 2 Co-Producers leading the event. We’ll open applications for those roles in the next couple weeks. In selecting the 2019 Co-Producers, we will be looking for candidates who are both able to work within the current model and excited to shepherd in the new. The 2019 Co-Producers will be instrumental in bringing together a group of Hub Leads who will in turn help craft the path forward and, ideally, be ready to step up into the Production Leadership Team roles in 2020. Eliminating the “Co” for the Hub Leads. We want the Hub Leads to all be individuals who can collaborate directly with each other, the Co-Producers, and the BOD. They should be able to set and execute strategy for their respective hubs and work with each other to do it for the event as a whole. We don’t know yet exactly what that’s going to look like and we won’t know until the Co-Producers and then the Hub Leads themselves are all in place. Department Leads brought on board a bit later in the Production Cycle. Again, we don’t yet know the specifics, but we don’t believe YOUtopia requires a team of ~70 people to be in place in Q1 of 2019. Some Department Leads can come on board in Q2 and some in Q3, as determined by the Co-Producers and Hub Leads. Co-producers are essentially working themselves out of a job. We highly encourage the 2019 Co-Producers to push authority down to Hub Leads with the goal to make themselves unneeded in 2020. We’ve gotten feedback from folks who want to be involved early in the planning process but don’t seem to know how. YOUtopia involvement has historically been driven by the Co-Producers, not the BOD, and it still will be. At the same time, we want to make sure we’re keeping open as many channels as possible, so people who have a vested interest in having a seat at the table do indeed have that seat (while we’re building the table). We didn’t actually talk about this much at the retreat, but wanted to mention (because we don’t know if this is in writing anywhere else) we will absolutely be revisiting the ticketing system for Art Grant Recipients and Volunteers. As it is every year, ticket pricing structure will be determined as part of the Budget process. Due to our Treasurer’s efforts, we now have easy-to-use budget templates that reflect what we actually do and that are compatible with our accounting software. We also finally have solid actuals for the last two years; it’s been a lengthy process to clean up our books, as there were no uniform systems in place until 2018 and each budgeting cycle involved a fair amount of guesswork. Now that we have two year’s worth of reconciled, uniform budgets and actuals, we have a pretty good handle on our hard/fixed costs (i.e. land, heavy equipment, etc), the % increases we can reasonably expect year over year for those hard/fixed costs, and our soft cost categories where there is infinitely more wiggle room. All of this will allow us to give the Co-Producers a template that’s much more usable, includes realistic projections to use as a starting point, and allows them easily hone in on the line items most in need of attention. It also will ideally support them in being creative. We would love to see innovative cost-cutting measures and we would also consider increased expenses for goods/services that mitigate risk, as many of our high-expense line items are also our most high-liability items (and take up the most volunteer time). Basically, we’re willing to spend more on expenses likely to improve the safety and efficiency of the event and operations, especially if it reduces the labor demands on our volunteers. We’re continuing to work on our timeline for post-YOUtopia wrap-up. Every year the BOD spends the couple months after YOUtopia wrapping administrative and oversight tasks. We’re working to document it all now to make our lives easier in the future. We heart Gantt charts. We also talked about exploring ticketing vendors other than EventBrite. We’ve been happy with EventBrite overall, but with EventBrite our waiver is part of our ticket and the whole thing needs to be physically printed, signed, collected at gate, then scanned/filed away after the event. We have a backlog of many years worth of waivers to be scanned, and the BOD is currently chipping away at them during “scanning parties.” We are going to look at other options to see if there is a different solution that will carry the same legal weight. Most managing entities within the burnerverse have a Code of Conduct (CoC) for their Regional Burns as well as their year-round activities. As of this writing, YOUtopia has a Code of Conduct for volunteers, but we don’t have anything for participants at the event, for CoLab, or for SDCAP events in general. This is bad practice because when people in our community engage in problematic behavior, we have no standard against which to hold them and no process for investigation or response. When especially egregious incidents occur and rise to the level of a safety/liability risk, the BOD gets brought in and responds in a reactive manner – also bad practice. We need a standard and a process. Luckily, because almost every other region has a CoC, we don’t have to reinvent the wheel. We’ve gathered up a bunch of them from other areas (Fire Pony – Playa del Fuego, AZ Burners – Saguaro Man, NC – Transformus, Boston – Firefly), and are cobbling one together out of the gold that already exists. We’re hoping to have it up for public consumption within the next couple months. In the meantime, the BOD is still working with the Producers and independently to resolve incidents that took place at YOUtopia 2018. As a general practice, outcomes are kept confidential for the privacy of those involved (and sometimes legally for the sake of HIPAA compliance). If you reported an incident to the BOD or Producers at/after YOUtopia 2018, we will be in touch soon to close the loop. Feel free to follow up with us if you have any ongoing questions and please understand that we will not be sharing any specific outcomes or personnel decisions. Most of what we talked about with respect to the BOD itself focused on 1) upcoming new member selection and 2) how to improve communications & collaboration with the community, YOUtopia Production Team, and CoLab Team. BOD Candidate Recruitment, Process, etc. Applications for the BOD are now open! If you haven’t already done so, read this post so you know what we’re looking for and what you’re getting yourself into. Then read the Job Description and apply! We spent time talking about our recruitment efforts and how we’re trying to attract people from diverse segments of the community, administrative tasks that are part of the process of bringing on new members, and how we’re going to impart institutional knowledge when we’ll have so many new peeps. One thing we’re considering is in addition to filling all 6 of the open positions, keeping on one or both of our outgoing Directors for an additional 1 year term. This is something the BOD has done at least twice in the past, for the express purpose of training new members so they could fill the roles being vacated. Due to the current BOD composition, we are not exactly sure how we’re going to stay afloat if we don’t have time to train someone for the Secretary role (including risk mitigation/insurance/contracts) and for year-round Art Grants Administration. We concurrently discussed transitioning outgoing Directors into external advisory roles, and that’s something we want to look at for future, but it doesn’t solve our current problem. We now have a BOD member dedicated to email and social media management, and they’ll be focusing on getting out regular posts and updates across various platforms. We’re also going to explore with interested community members (a couple folks have stepped forward) how we can work together to push our content so it winds up in front of as many people as possible. 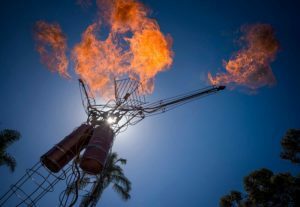 As we keep saying, the total population of burners in the San Diego region is well into the thousands, but we can tell from analytics that only dozens – or if we’re really lucky, hundreds – of people see the content we generate. And as you may have noticed over and over again in the above, we’re presently all about moving toward standardized processes. That applies to SDCAP, YOUtopia, and CoLab. Because a move toward standardization in itself involves lots of changes – big and small – we’re expecting (and experiencing) some growing pains. We understand it’s especially difficult for people to do things differently when they’ve been doing them their way for many years. Our hope is that by focusing on improved communications that address “the why” behind what’s happening, the changes will be a little bit more palatable. Finally, for internal communications, we’re looking at ways to improve our own processes. In the Production Survey, one of the suggestions we received for YOUtopia was to use software like Loomio for decision making. The BOD is considering piloting it for ourselves, once we can get the luddites among us to commit. In a perfect world, the BOD will use it, love it, evangelize it, and then everyone else will want it, too. We also heard a rumor that other production teams have their own Slack channels. Just sayin’. Getting together in person is good. We’re going to aim for quarterly Town Hall Meetings at CoLab. The next one will be for the BOD Candidate Interviews/Advisory Elections, held on Sun, 1/13/19 from 11am – 2pm. If you have topics/themes you want to cover in Q2 or beyond, send ‘em our way! Or let us know you want to host the Town Hall and we’ll support you in doing that (pro-tip: you don’t need the BOD to put on a Town Hall, but we’ll attend if you host it and help you however we can). We warned you this was gonna be a long post! And you persevered and made it to the end! We don’t usually report out after retreats or report anything at such length, but given the recent community requests for increased transparency, we thought it was important to do so. We realize you might disagree with decisions we’re making. We didn’t share all this information to convince you our way is right, but rather to pull back the curtain and provide more context and rationale for our decisions. And also to illuminate ways in which you can be part of decision-making moving forward. In much the same way we approach consensus within the BOD, we hope we’re increasing understanding, if not agreement. BOD Applications are now live! But you gotta read the final, final, final Job Description to get to the application. Oh and hey, if you haven’t already, we recommend reading this blog post about the selection process before you apply. It’s painstakingly detailed and will give you a pretty good idea of what you’re doing by throwing your hat in the ring. As usual, email BOD@SDCAP.org with questions. Do you have an idea or vision for large interactive art? 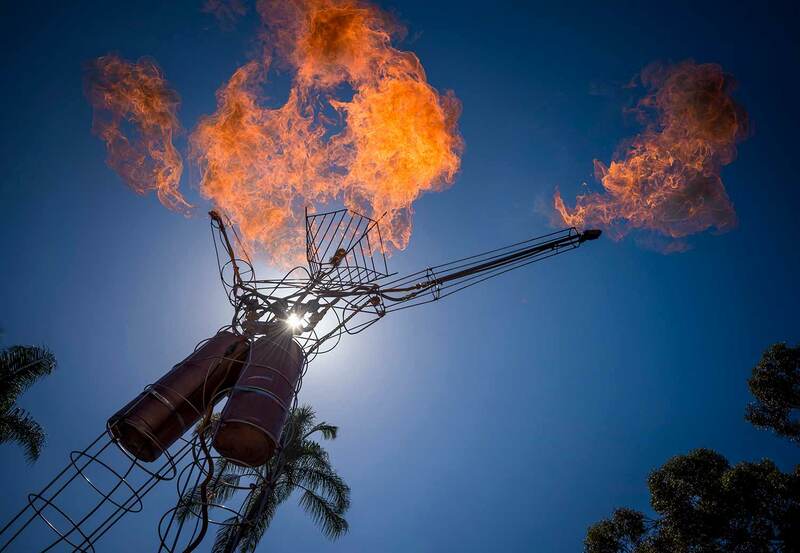 Do you want to build it in San Diego and take it to Burning Man? If so, we have a grant opportunity just for you! 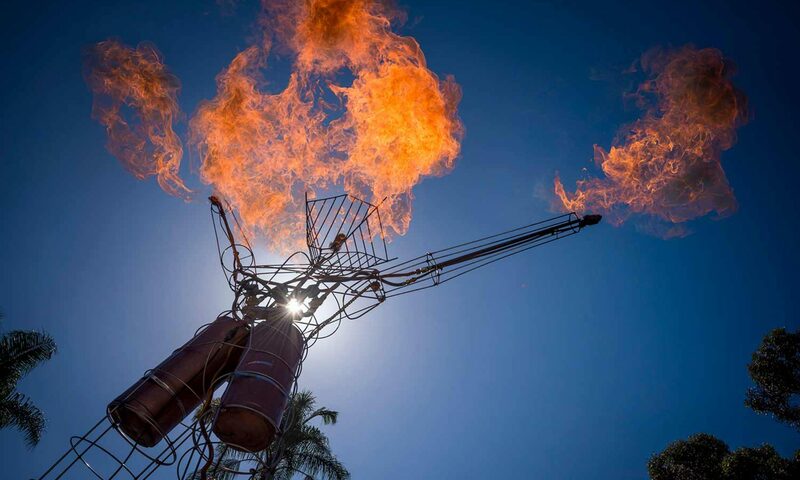 The SDCAP SD Regional Collaborative Arts Grant for community driven art destined for Burning Man is now open! A grant for matching funds up to $15,000 is available! Proposals are now being accepted and the deadline for applications is Dec. 31st. We can’t wait to see what you want to create for so many to enjoy – happy arting! For more information and to submit a proposal please follow this link.